Hand Jive is an independent clothing company created by designer Dawn DeSanto. The company is based in Fort Wayne, Indiana and specializes in fun, funky apparel for women of all ages. Every Hand Jive piece is made by hand and is full of personality, featuring a bohemian flair that still feels totally current. Tank tops and blouses feature loose, breezy fabrics and multicolored patterns mixed and matched in a truly one-of-a-kind way. 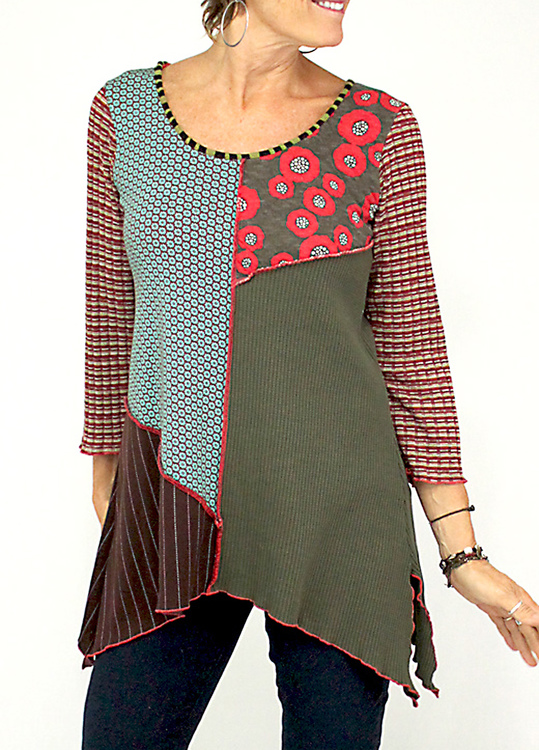 Hand Jive also makes tunic tops that can be worn with leggings or jeans and vests that are perfect for layering over other items. You’ll also find flattering dresses in retro shapes and styles in chevron prints, peacock patterns and other bright, bold shades. If you’re looking for clothing that will really make a statement and make you feel unique and inspired, be sure to look out for Hand Jive at Sugarloaf Craft Festivals.